Since we live in Japan, our news is filled with talk about nuclear power plants and the effects of Fukushima after the 3/11 disaster last year. My kids talk about it too, but nuclear power and the process behind it is difficult even for adults to understand. This book attempts to explain nuclear power to older children, by introducing the scientific process and previous nuclear incidents, as well as safer energy options for the future. My kids are younger than the recommended age for this book, but I read aloud some parts and it was easy for them to understand all but the part about the scientific process behind nuclear fission. I can see that it will be a useful reference for them in the future. Actually it was pretty useful for me! I especially enjoyed the introduction of Lise Meitner, a physicist who came up with the theory of nuclear fission while skiing with her nephew. That's a true Eureka moment! This is especially good timing since March is women's history month, and I hope to do more nonfiction books about women in history with them over the next few weeks. My kids were most interested in the section on safer energy. I think that's partly because there are no nuclear plants online at the moment in our part of Japan, so the news is constantly talking about reduction in energy consumption and alternative energy sources. Also, we have solar panels and can see a wind farm from our kitchen window, so these are more visual for them than nuclear energy (I guess they need to watch The Simpsons more often). This part of the book was well done but there was no mention of reducing power consumption, even though that is probably the easiest way for kids to get involved. The cover is colourful and eye-catching. The orange as a background inside the book makes the text a little hard to read, however. The part of the book written about the 3/11 disaster was written in the present tense which presents an immediacy which is popular with readers of dangerous non-fiction books about sharks or volcanoes. I was not enamoured of it, however, the disaster is still too fresh. Also, the name of Hiroyuki Kohno, the outspoken member of the Fukushima Fifty, was misspelled as Horoyuki Kohno. Normally I would be harder on this mistake, but I made a mistake of my own last week and understand how it happens (not that I have an editor!). Overall, this is an okay reference for kids or even adults who are wanting more information about the nuclear disaster at Fukushima with background in the mechanics of nuclear fission. This post is for Nonfiction Monday, a recurring event in the Kidlitosphere, hosted this week by 100 Scope Notes. I enjoyed reading your post on the book. Thanks for commenting so I could find you! I love your blog- I will be back looking for more science books! Hi Medea, what an interesting book, seems like most everyone in the Nonfiction Monday community is doing the same thing: exploring women in history and their contributions to the world. We are about to launch our new bimonthly theme on Girl Power and Women's Wiles. Will pin this book in our Pinterest board so that I can be reminded to look this up in our library. Thanks for sharing. I am loving Pinterest for book exploration lately. Almost as much as Goodreads! Given how recently this occurred, I thought Dr. Fred did a good job of putting this together. I think students in the middle school would be interested in it. I completely agree. Not even a year- that's pretty impressive. thank you for posting about this, looks like a good read. Thanks for linking it Jojo! 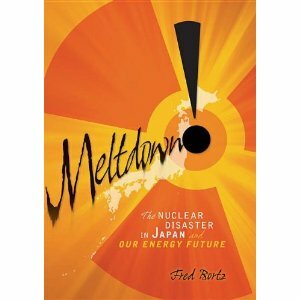 I think this is really good for those of us in Japan who want a succinct explanation of the science behind Fukushima. I reviewed this book a few weeks ago, and I think Dr. Bortz does an outstanding job of explaining something that is extremely complex. I can certainly understand that the disaster is too fresh in your mind, however, for those of us here in the States, I think it's an excellent cautionary tale. My sympathies to you as the anniversary approaches. It was truly a horrific time in history. I agree, I have read so much about Fukushima and nuclear power since but nothing else has been as good about explaining the complexities. This looks like a great book for adults too! LOL I have no idea how nuclear energy works. I will check it out. Definitely! I am pretty sure I got more out of it than my kids. Loved your perspective. I'll alert my editors to the typo for the next printing. Also, you might want to read some of the excellent biographies of Lise Meitner, whose story I love to share. She was my selected Physicist of the Decade for the 1930s in my high-school/college reference book Physics: Decade by Decade (Twentieth-Century Science set, Facts on File, 2007). Thanks so much for commenting, and for writing a book on a disaster that still affects us. I will look for your physics book too, this book whet my appetite for more. What Are You Reading on World Read Aloud Day?